This incredible looking ride is best suited to jazz, and is an acquired taste. 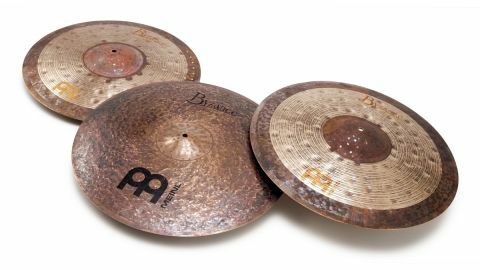 Meinl is a company that needs little introduction when it comes to the cymbal world. With an artist roster boasting huge names such as Benny Greb, Anika Nilles, Matt Halpern and Thomas Lang, the German giant is undoubtedly one of the world's pioneering cymbal manufacturers. Founded in 1951, the company has developed and grown to now produce a wealth of cymbal types suitable for players of any style and budget. With many of its cymbal ranges benefitting from a host of new additions for 2015, the beautiful Byzance series is no exception to this treatment. With six separate lines under the Byzance name alone (collectively dubbed the 'six degrees of darkness'), Meinl has clearly gone all-out to offer us drummers a wealth of unique and interesting instruments. This month Rhythm takes a look at one of these recent arrivals in the form of the Symmetry ride. The 22" Symmetry ride joins the company's Byzance Jazz line and it is a signature model of Berklee Professor Ralph Peterson. This range is partially lathed. Starting 2" in from the rim of each cymbal, the coarse lathing pattern runs up just shy of where the domed bell shape begins. Coupled with the large hand-hammed marks across the bow and smaller ones on the bell, this generates a striking aesthetic that evokes a real sense of tradition in the cymbal-making process. The large Symmetry ride offers a slightly lower pitch than other models in the Byzance range. This cymbal is very loud and quite sharp, producing an extremely metallic, almost ping-y attack. This gives it the ability to cut through a mix like a razor blade - which might of course come in rather useful, although can be unruly in more of a subtle jazz context. But, we must warn you, the Symmetry rides are not for crashing. So much so that they almost lean towards more of an FX cymbal. As a result, we would wager that purchasing one of these as a main ride would most likely leave you disappointed.The colossal diameter of the bells are certainly a novelty though, and do work very nicely for Latin-style grooves and bell patterns. Once again though, they are extremely loud!